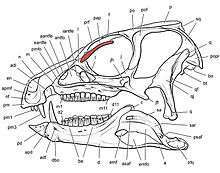 The palpebral bone is a small dermal bone found in the region of the eye socket in a variety of animals, including crocodilians and ornithischian dinosaurs. In ornithischians, it can form a prong that projects from the front upper corner of the orbit. It is large in heterodontosaurids, basal ornithopods such as Thescelosaurus (as Bugenasaura) and Dryosaurus, and basal ceratopsians such as Archaeoceratops; in these animals, the prong is elongate and would have stuck out and over the eye like a bony eyebrow. As paleoartist Gregory S. Paul has noted, elongate palpebrals would have given their owners fierce-looking "eagle eyes". In such cases, the expanded palpebral may have functioned to shade the eye. 1 2 Norman, David B.; Sues, Hans-Dieter; Witmer, Larry M.; Coria, Rodolfo A. (2004). "Basal Ornithopoda". In Weishampel, David B.; Dodson, Peter; Osmólska, Halszka. The Dinosauria (2nd ed.). Berkeley: University of California Press. pp. 393–412. ISBN 0-520-24209-2. ↑ Sues, Hans-Dieter; Norman, David B. (1990). "Hypsilophodontidae, Tenontosaurus, Dryosauridae". In Weishampel, David B.; Osmólska, Halszka; Dodson, Peter. The Dinosauria (1st ed.). Berkeley: University of California Press. pp. 498–509. ISBN 0-520-06727-4. ↑ You Hailu and Dodson, Peter. (2004). Basal Ceratopsia. In: Weishampel, David B.; Dodson, Peter; and Osmolska, Halszka (eds.) The Dinosauria (2nd Edition). Berkeley: University of California Press. p. 478–493. ↑ Paul, Gregory S. (2000). "Restoring the Life Appearances of Dinosaurs". In Paul, Gregory S. The Scientific American Book of Dinosaurs. New York: St. Martin's Press. p. 102. ISBN 0-312-26226-4. ↑ Naish, Darren; David M. Martill (2001). "Ornithopod dinosaurs". Dinosaurs of the Isle of Wight. London: The Palaeontological Association. p. 79. ISBN 0-901702-72-2.